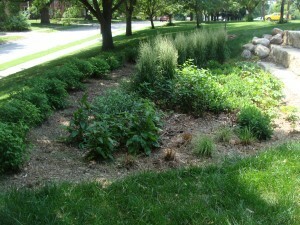 Thanks to a collaborative project that’s putting stormwater management center stage in classrooms across Benson High School, the Benson High School Rain Garden Initiative was formed. 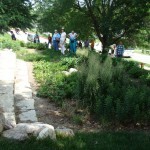 The project brings together the City of Omaha, Omaha by Design, Benson High School (BHS), the Benson-Ames Alliance and Community ReDesigned to plan, design, install, maintain and promote a new rain garden on the grounds of the school. At the beginning of the fall semester, representatives from the partnership met with Benson faculty to determine their individual interests for participating in the project. The response, said Benson High School magnet coordinator Peggy Pavlik, was positive, and ran the gamut from math, earth science and chemistry instructors to those who teach computer aided drafting and marketing. 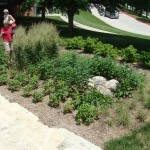 Students then began work on the initiative by selecting a project name, logo, and location for the rain garden. 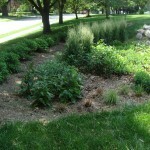 A rain garden is a planted depression that allows runoff from impervious surfaces like parking lots and sidewalks to soak into the ground instead of flowing into storm drains and surface waters where it contributes to erosion, water pollution and flooding. 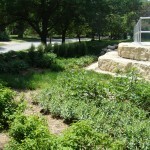 These gardens, which use native plants, can cut down on the amount of pollution reaching local creeks by up to 30 percent. 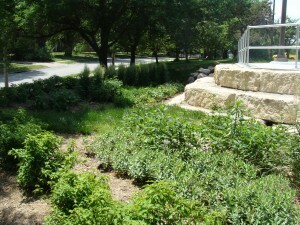 The garden will be located on the school’s southern edge near the old entrance. 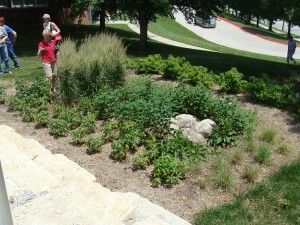 During the next six months, BHS students designed the layout of the garden, researched and selected appropriate plants for the garden, produced a conceptual design and layout, helped facilitate the construction bidding process, oversaw the construction of the garden and even helped promote it to the general public. 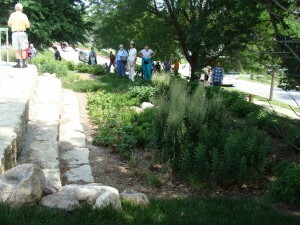 The site now serves as an outdoor classroom for students.